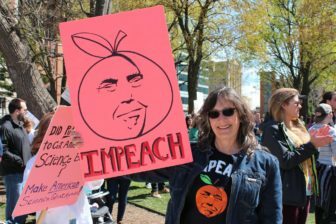 Hundreds of people joined in the March for Science on Saturday, April 22, at the Capitol to celebrate Earth Day. The mission of the march was to encourage evidence based policy, or the use of scientific studies, to create or improve policies. Marchers expressed their concerns in many ways. Some gave speeches while others performed poems or songs. Petra Daher of the Michigan Puppet and Mask Collective marched to preserve funding for the Great Lakes. Members of the Michigan Puppet and Mask Collective marched with a group of other people and organizations. They all called themselves the Nature Brigade. 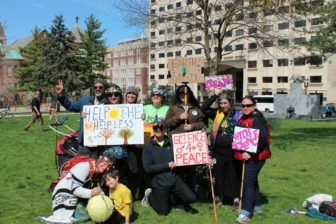 The Michigan Puppet and Mask Collective is a group of artists, activists and environmentalists who promote environmentalism and civil rights. “We have a long haul ahead of us, confronting 45 (President Trump) and his horrendous policies, and so we wanted to do something playful and creative because we need to feed our souls while we continue to fight for peace and justice,” Daher said. On Tuesday, March 28, President Donald Trump signed an executive order that curbed the federal government’s enforcement of climate regulations. The marchers oppose that. Michigan State Department of Community Sustainability professor Laura Schmitt Olabisi had a lot to say about the president’s decision. Caroline Bruce was in Lansing for the march because she opposes a number of Trump’s policies. Bruce shows off her creative sign. Michigan State seniors Madi Kraus and Hannah Stoloff said that they hope for change. Stoloff said that change is hard to do on a systemic scale. Hannah Stoloff and Madi Kraus, seniors at Michigan State University march for Science. Kraus said that the people need to protect the place where we live. Christina Pastoria, a Michigan State senior and member of the Sustainable Spartans, agrees. Voting for environmentally conscious leaders and making environmentally conscious business decisions are a few ways that Pastoria said people can help stop climate change. 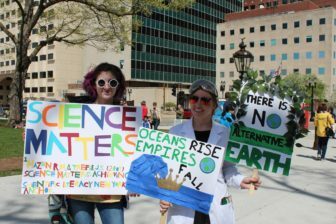 March on Science: Lansing, Michigan from Jessica Hanna on Vimeo. Jessica is a student journalist at Michigan State University. She is a Health and Beauty writer for VIM Magazine, a student-run fashion and beauty magazine on campus. Her interest is in magazine journalism, but she also enjoys reporting news stories of all varieties. MSU faculty and staff must balance freedom of expression with student safety. The Office of Institutional Equity is at this controversial and difficult balance point. The office is the channel for students to report discriminatory acts or hate speech. This Michigan State journalism project looks at how First Amendment freedoms of religion, speech, press, assembly and petition are exercised and tested during the first 100 days of the Trump administration.